Today, I gave my first Arduino lesson to my sons (ages 8 and 12) and their friend (age 13). It only covered identifying parts of the arduino board, hooking the arduino to the computer, starting the IDE, using the built in blink example, changing the example to flash S.O.S. in Morse Code, refactoring the example so that it uses a â€œdotâ€ and a â€œdashâ€ function, and then writing something else in Morse Code of their choice. The lesson print out is below, but let me give some insight into how it went. My younger son (8 years) had some trouble with putting the â€œdelayâ€ command between the digitalWrite(13, HIGH) and digitalWrite(13, LOW). Delaying while the light is off made sense to him, but using it to keep the light on was counter intuitive and difficult for him to grasp. I need to find a good way to explain it. My sonâ€™s friend (13 years) had no trouble. He was able to do the morse code with no trouble. 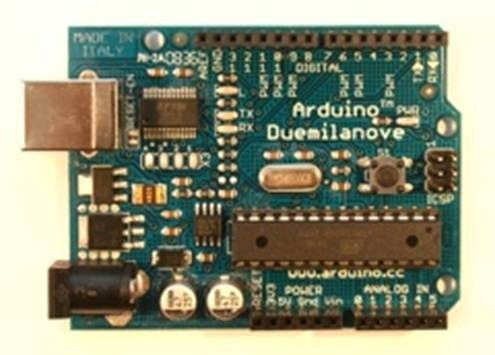 I think all in all, this lesson would work out best for 6 grade and above..
Activity 2: Connect the Arduino to the computer using the USB cable. Which lights come on? What do you think that means? 3. function are commands that are built in and that you can define yourself. There are two functions that are defined here: setup and loop. These are very special to the arduino. When defining a function you have to specify if the function will â€œreturnâ€ a value. Since these do not return a value, you see that â€œvoidâ€ is listed before their names. Do not worry about understanding this now. It will make more sense later. 4. After the function name is defined there is a set of () with nothing in them. This is where the parameters of the function will go. â€œsetupâ€ and â€œloopâ€ do not take parameters so they are blank. Again, do not worry about understanding it now. It will make more sense later. The â€œsetupâ€ function gets called one time. The â€œloopâ€ function gets called over and over and over again. Take a look at this program. Can you figure out what it does? In the setup function there is a statement: pinMode(13, OUTPUT); This set the Digital Pin 13 to be in Output mode. This means we will be sending a value to this pin. You could specify INPUT which would mean that you would want to â€œreadâ€ a value from this pin. This we will do when we get to buttons. In the loop, there are two functions used: digitalWrite and delay. digitalWrite will turn â€œonâ€ the pin when it is â€œHIGHâ€ and turn â€œoffâ€ the pin when it is â€œLOWâ€. delay will wait the specified number of milliseconds before the program continues. How many milliseconds are in a second? How about in 10 seconds? How about in a minutes? 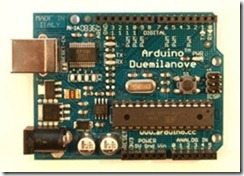 Activity 4: Upload the sketch to the arduino and see what happens. Do this by click â€œfileâ€ and then â€œupload to I/O boardâ€. Notice which lights blink as it is uploaded. Then what happens. Does it do what you thought it would? Click the â€œresetâ€ button. Now what happens? Activity 5: Blink S.O.S in Morse Code. SOS is dot dot dot dash dash dash dot dot dot wait and then repeat it again. Dots mean that the light is on for a short time, and dots mean the light is on for a long time. How can you modify this program to make the lights blink this way? Activity 6: Use a function to make our code nicer. See how we use the digitalWrite(13,High), delay(â€¦), digitaWrite(13, LOW), delay(â€¦) over and over again for the dash and the dot. And in our code it is difficult to make out where the dots are and where the dashes are. Letâ€™s make our code easier to read by defining two functions, and then using them. Notices how the dots all blend together? How can we fix that?